Palladium is a comparatively new precious metal, which was discovery more or less by chance. The English chemist and physicist, William Hyde Wallaston, first extracted palladium in 1803 during a processing operation on platinum ores. Palladium is one of the most important precious metals in the industry today and, thanks to its chemical properties, is preferred in the automotive industry (for the manufacture of catalytic converters) and increasingly in the watch and jewellery industry too. As a rare precious metal, palladium represents an interesting investment object next to gold and silver. In the last few year, Heraeus, the Hessian technology group, has specialised in the precious metals segment mainly on the production of gold bars, but its product range also includes high-quality cast and mint bars of silver, platinum and palladium. The latter are available in four different sizes from 100 g palladium to 1 kg palladium. Originally, palladium particles were to be found in in river sediments of the Ural Mountains, Australia, Ethiopia and North and South America. Unfortunately, these sources are largely exhausted today and so it is now predominantly extracted from palladium nickel ores in production countries such as Russia, South Africa, Canada or the USA. The production of palladium bars is similar to other precious metals. 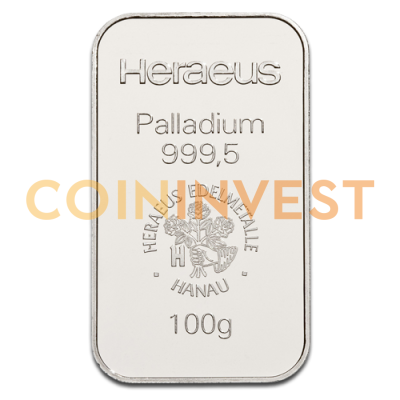 Heraeus 1 ounce, 100 gram and 500 gram palladium bars are, however, produced exclusively as mint bars, 1 kg palladium bars in the minting process. From a pre-cast and rolled plate made of 999.5/1000 palladium, the bars are punched out and then minted in a press. Here, the individual palladium bars are given their distinctive inscription, which in addition to the Heraeus Company logo also states the name of the manufacturer, the palladium description, the purity of 999.5 and the weight. Heraeus 100 g palladium bars are 49.7 mm long, 28.5 mm wide and 6 mm thick and are securely sealed in a blister pack with a certificate to protection against dust and other damage after minting. Although investors still predominantly invest in commodities such as gold and silver, due to the increasing use of and demand for palladium by industry, this precious metal is also becoming an increasingly attractive investment object. Including palladium in your portfolio is certainly worthwhile. Are you interested in expanding your portfolio to include a future-oriented precious metal? You now have the opportunity to purchase your 100 g palladium bars at CoinInvest conveniently online. 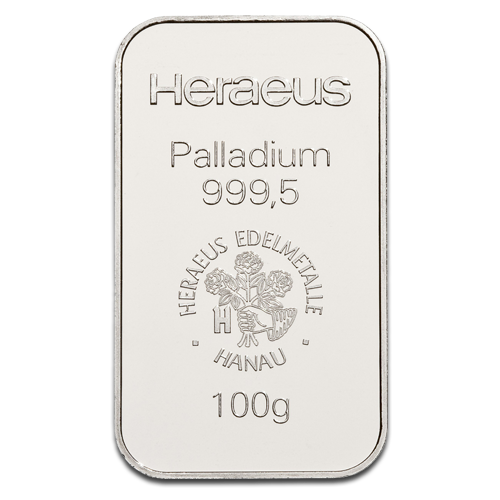 In our online shop, you will find the certified 100 g Heraeus palladium bars at a price based on the current commercial rate. If you would like to sell a 100 g bar from Heraeus, you can also find a suitable point of contact for this; contact us by phone or email.